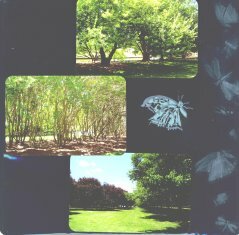 This title page for the Norfolk Botanical Gardens Scrapbook used a technique called Masking for the title in the center. The Title was first stenciled using chalks of purples, teals and blues. Then, I placed a piece of scratch paper that was 8 x 8 inches over the title. That was the "mask". Then I used the chalks again in the same colors, and dragged the chalk across the mask paper onto the background paper and blended with my fingers. Once the mask was removed it revealed a frame, of sorts, in the shape of the mask. 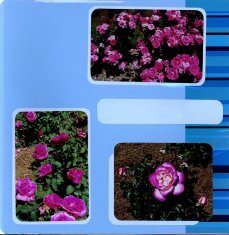 The flowers were various die cuts of leaves and flowers, highlighted with "Glossy Accents" (See our page on Adhesives.) to make them shine. They were pieced together with pink brads. The purple Butterfly accent was a purchased sticker. 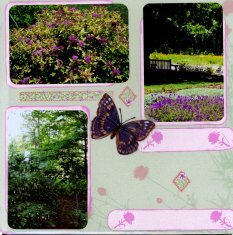 Paper used for this set of Layouts was from Club Scrap Kit from May 2006 called Natures Wonders - a lovely kit of pastels and floral designs. The light green background card stock was accented with a light weight printed paper that was torn for corners and a partial photo matte. Embellishments used were 2 printed paper tags that came with the kit and light blue brads on the corners to adhere the torn paper. 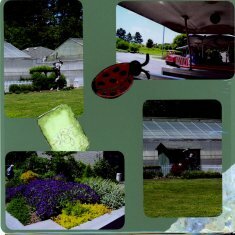 The lady bug was a die cut that was coated with Glossy Accents to make it shiny. The navy blue paper used as the background for this set of Layouts was from Club Scrap Kit from Jan 2006 called Framed - a kit of blues and grays. Embellishments used were 3 lighter blue printed tags from the Natures Wonders kit. 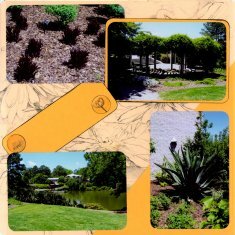 Papers used for this set of Norfolk Botanical Gardens Scrapbook layouts was from the Natures Wonder's kit in solid light orange and the pastel orange print. 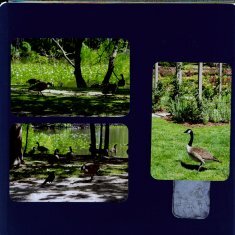 One photo is matted with solid orange with the edge inked in a dark blue ink to make it pop off the page. Embellishments used were 3 solid orange tags from the Natures Wonders kit with printed cut outs. These tags will eventually be used as labels for the kind of plants and flowers in the photos. 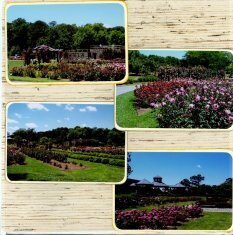 These layouts above show photos of the Norfolk roses that were planted in rows upon rows. 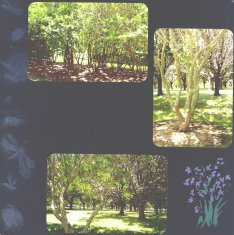 The background paper was a woven bamboo that I purchased from Magic Scraps years ago. The Embellishments were photo mattes of a solid ivory inked on the edge with a dark brown to make them stand out from the background. 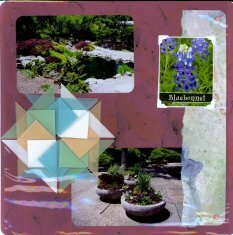 Above, the photos of the Butterfly Garden at Norfolk use a very old light green printed card stock for the back ground paper from Club Scrap from the April 2001 kit called Garden La Fleur. Embellishments used were 3 printed tags from the same kit, with the edges inked with pink ink. 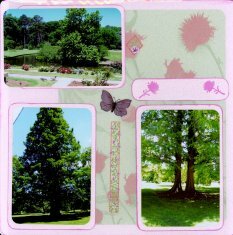 Two butterfly stickers were used along with several garden motif stickers from Creative Memories. 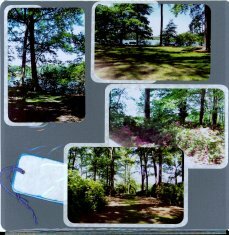 These Norfolk Botanical Gardens Scrapbook layouts above of the groves of trees used a background of navy blue card stock from Club Scrap's kit called Bugs. While the name sounds a little strange, the borders of the card stock are embossed with dragon flies and butterflies and it is really stunning. To make the embossing show, I used a light blue chalk to enhance the embossing. Other embellishments were 2 stenciled images from the same kit, chalked with two colors of blue chalk. The stencil was also from the same Bugs kit. 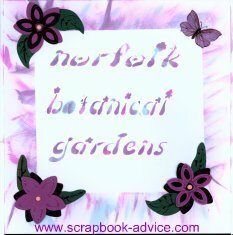 These layouts above of the many purple flowers on display at the Norfolk Botanical Gardens used a background light green and lavender printed paper from Club Scrap's kit called Natures' Wonders. 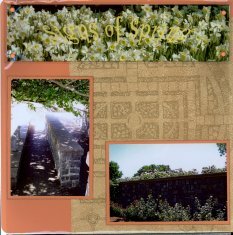 Embellishments were photos mattes of the light green and lavender solid card stock edged in ink of the same color. Three tags from the green card stock are accented with the lavender ink on the edges and have grape embroidered stickers from Jolee's. 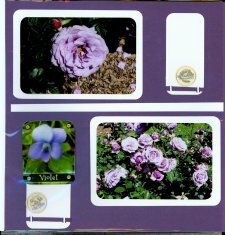 The tags will be the journaling blocks to identify the types of flowers. 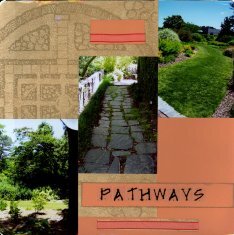 These layouts of the many Garden Pathways at the Norfolk Botanical Gardens used the perfect printed card stock from Club Scrap called English Garden. 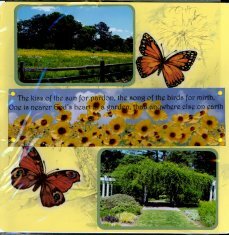 The formal English Garden print is accented with the orange solid from the Natures' Wonder's kit. Embellishments were photos mattes of the orange inked in ink of the same color as the brown printed paper. Three tags from using left over card stock are accented with the ribbon from the kit. 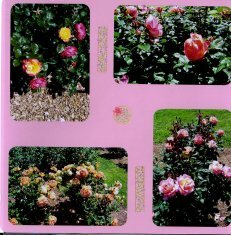 The right side page topper is floral transparency over a white background attached with 4 orange brads in the corners. 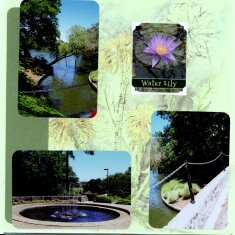 These photos above show the Water Features at the Norfolk Botanical Gardens and used for a background one of the light green prints and two border strips from the green solid, both from the Natures' Wonders kit. For this layout, all photos and border strips had the corners cut with a corner rounder punch to give a softer look. The only other embellishment on this page is the transparency of a water lilly, mounted on a white background with four white photo corners. 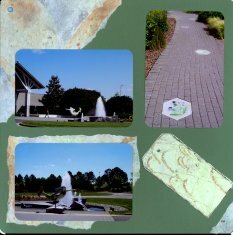 More water features from the Norfolk Botanical Garden using Club Scrap's kit called Mothers Tribute released as special kit several years ago. 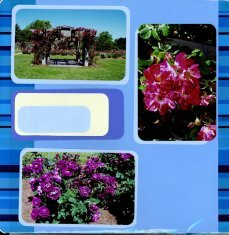 No embellishments were used on these pages, just the interesting floral designs on the paper. 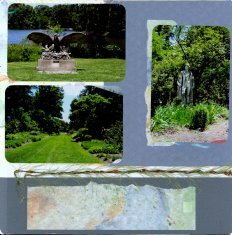 These Statuary photos from the Norfolk Botanical Garden Scrapbook are matched with a combination of Blue Gray from the Framed collection from Club Scrap and the printed paper from Natures Wonders. 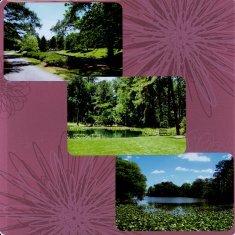 The photo mattes are the printed paper, some torn and some cut with rounded corners. The green eyelash fiber enhances the left page and the 2 white tags edged in blue ink tied with a blue cording enhance the right page. 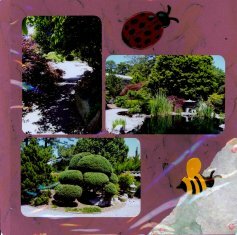 Norfolk Botanical Gardens Scrapbook Photos from the Japanese Garden using paper from the Asian Artisan collection from Club Scrap. The page on the left is one sheet of green printed paper, the page on the right is a 12 x 12 tan printed paper cut down to 11 x 11 and attached to the green with brass colored brads in the corners. Embellishments on the both pages include Red Misuhuiki cording and a brad holding 3 oriental coins. Additional oriental coins are holding the cording from two gold tassels. Three green tags are tucked away under the photos for journaling about the items in the photos. 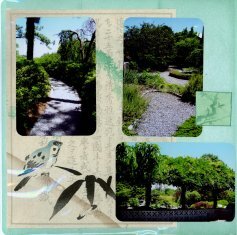 More photos from the Japanese Garden and again using papers from the Asian Artisan collection. The left page uses only 1 printed green for the background paper. The right page uses an 8 1/2 x 11 page, uncut, on the top of the another green printed paper. Very simple, like at the Norfolk Botanical garden, the only embellishments are 3 small cut outs from the kit, and one white tag, edged in green ink, with a small cut out and sheer ribbon tied through the hole in the top of the tag. 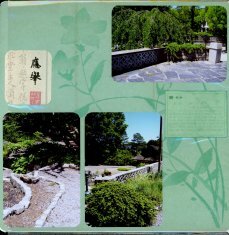 More photos from the Norfolk Botanical Gardens Scrapbook Japanese Garden and patio area, this time combing papers from the Asian Artisan collection and the Natures Wonders collections. Embellishments on the both pages include a torn paper border and corner, mounted with pink brads. 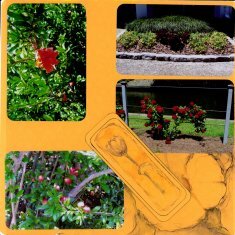 On the left page are another of the Red Lady Bug Die Cuts coated with Glossy Accents as well as a Bumble Bee Die Cut also coated with Glossy Accents. 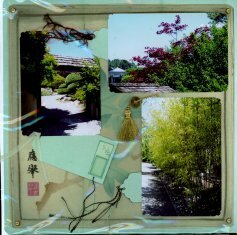 The embellishments on the right side are another of the transparencies backed with white card stock and mounted with four white photo corners. The large embellishment is a paper folding using small origami squares of translucent paper from the Asian Artisan kit. More photos here from the Butterfly Garden this time mounted on a yellow floral print background from Club Scrap's Nature's Wonders kit. Embellishments are several more of the butterfly stickers. 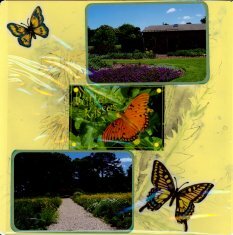 The butterfly photo in the middle of the left page is another of the transparencies mounted on yellow card stock and attached to the page with yellow brads in the corners. The sunflower photo across the center of the right page is another transparency, mounted on yellow and attached with 4 more yellow brads. 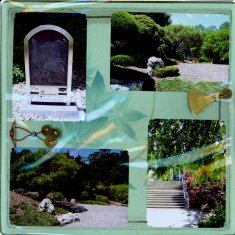 The photos were all cut with a corner rounder, as were the green mattes. Norfolk Botanical Gardens photos of the beginning of my trip through the Rose Garden were all of the pink roses. 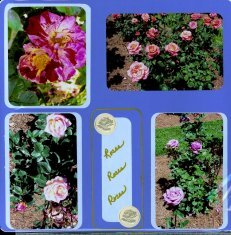 The reason for all the rose photos was so I could identify some varieties I used to grow and add them to my new garden. The background was just a solid blue cardstock - the brand is unknown. 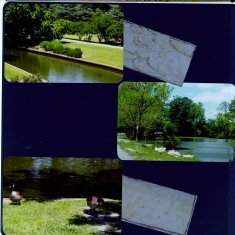 The photos are all matted on a lighter blue, and all have the corners rounded with a corner punch. The Journaling block in the left, says Roses, Roses, Roses and is hand written in gold pen. The blue matte is also edged with the gold pen. Scattered over both pages are Gold Rose Stickers that I picked up in the wedding department of a craft store. 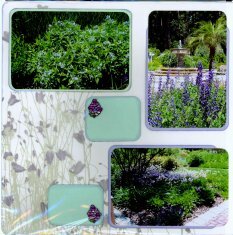 The Trellis on the right is made with card stock and light blue 1/4 inch ribbon and resembles a French Notice Board. The Ribbons are fastened at the outside intersections with blue brads. 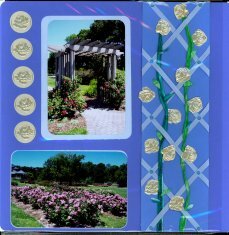 The vines on the trellis are made from twisted green paper called Twistel and the roses are more of the gold rose stickers with the circular edge trimmed off. The Red Roses photos were so stunning I needed a brilliant red for the background. This paper was also from my stash from long ago. 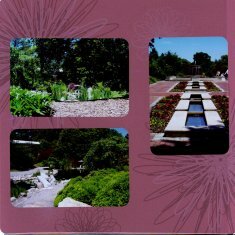 All photos were mounted on white glossy card stock, with corners rounded. 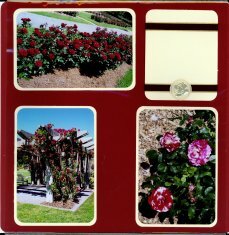 The embossed stamp of the roses, was stamped in clear VersaMark and embossed red and green embossing powders. 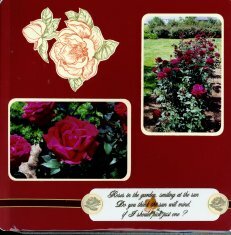 The Journaling block is a transparency placed over the glossy card stock says: "Roses in the garden, smiling at the sun, Do you think the sun will mind if I should pick just one?" I thought it was very fitting for these pages. The Red velvet ribbon with the gold edging on both journal blocks was picked up at A. C. Moore also and is joined by 2 more of the rose stickers. 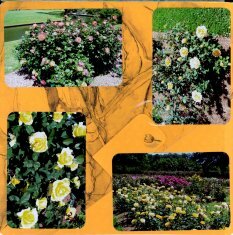 The White, Yellow and Orange Roses here on these pages are again placed onto the orange printed cardstock from the Nature's Wonders kit. 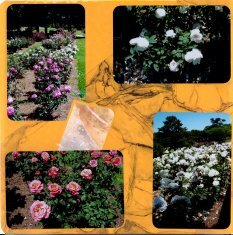 Mo mattes, just the rounded corners and two journaling tags which will contain the names of the rose varieties. These are tucked in behind the photos. 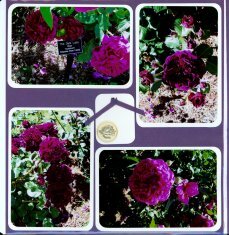 New are the Dark Red and Purple Roses, mounted on Purple Bling card stock from Bazzill. All are mounted on White Bling card stock. The three journaling tags are also the White Bling, punched with a ribbon punch and 1/4 purple ribbons to attach the to the background. The Gold Rose Stickers are attached to each of the jornaling tags. Above the journaling tag on the right page is another Transparency mounted on white card stock with 4 gold brads. 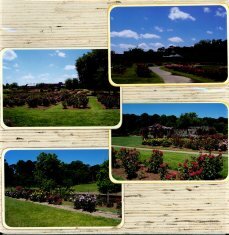 More photos from the Rose Garden of the Varigated Varieties. 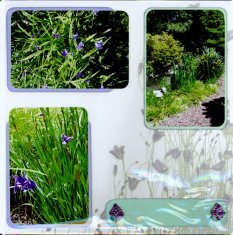 Again I placed these on the blue background and made a border with a striped multi color blue. All the photos were matted on a lighter blue mattes and were punched with the corner rounder. There are 2 journaling boxes in varying sizes of the same rounded rectangle. 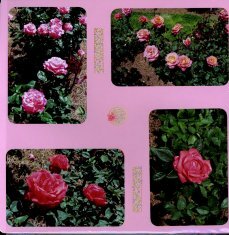 More photos from the Pink Rose Varieties. Mo mattes were used here, just the photos again, rounded with the corner punch, and mounted on the Pink Bling card stock by Bazzill. The embellishments on this page were some round and strip lacy stickers from Creative Memories.